The SpaceX Falcon 9 rocket carrying the classified NROL-76 spy satellite for the U.S. National Reconnaissance Office stands atop Launch Pad 39-A at NASA's Kennedy Space Center ahead of a planned May 1, 2017 liftoff. CAPE CANAVERAL, Fla. - The U.S. National Reconnaissance Office (NRO) isn't saying much about its new spy satellite, now scheduled to blast off on a SpaceX Falcon 9 rocket Monday (May 1), but it will be heading into low-Earth orbit, SpaceX's launch license shows. The license was issued on Friday by the U.S Federal Aviation Administration's Office of Commercial Space Transportation, which has oversight of the mission, including responsibility for public safety. Aside from flying from a civilian government range, which triggered FAA's oversight of the mission, the NRO purchased the rocket ride from SpaceX through a contractor, Ball Aerospace, a satellite and instrument builder based in Boulder, Colo. Terms of the NRO's Launch Services Integrator contract, were not disclosed, said NRO agency spokeswoman Karen Furgerson. Ball Aerospace could not be reached for comment. In addition to the NRO launch, which was announced last year, SpaceX has won Air Force contracts to fly two next-generation Global Positioning System satellites in 2018 and 2019. The National Reconnaissance Office (NRO) tweeted this mission patch for its NROL-76 satellite, showing Lewis and Clark setting out to explore the Louisiana Territory. Under terms of its launch license, SpaceX was required to buy $160 million worth of insurance to cover potential claims resulting from the flight of the Falcon 9 from Kennedy Space Center and $12 million to cover potential damages during preflight activities. The FAA also required SpaceX to buy another $100 million of insurance to cover damage to government property from a launch accident and $63 million to cover government property damage claims during prelaunch activities, the launch license shows. 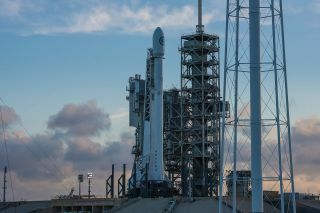 Editor's note: SpaceX's live webcast of the NROL-76 launch will begin Monday, May 1, at about 6:40 a.m. EDT (1040 GMT) for the 7 a.m. launch window opening. You can watch it directly from SpaceX here, or here at Space.com, courtesy of SpaceX.